Parents are the most important people in their children’s lives and always will be, so we need your help to ensure that all the children progress and achieve success in reaching their potential. When children come to nursery, we build on the foundations that have been laid and work in partnership with you to continue and develop this. Once children have settled at nursery, we hope parents will be able to stay and help from time to time. Parents, grandparents and other carers are always welcome in nursery. They can help in different ways - joining in activities, sharing books with children, helping them on the computer, baking, playing games, accompanying us on visits. The partnership between the family and the nursery staff is crucial to children’s happiness and development. 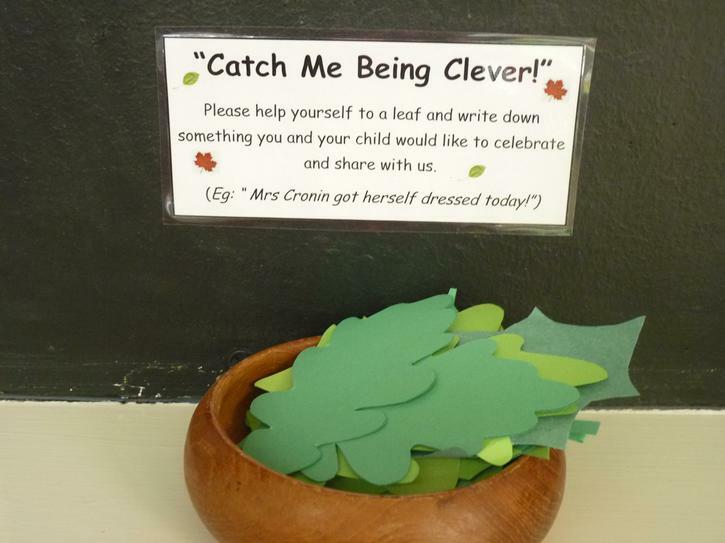 Take a leaf from the cloakroom and write down any milestones or achievements your children have made at home so that we can celebrate them in Nursery. This is a lovely way for parents to share their child with us. You can put anything in you like, e.g. A photograph and tickets for a special trip they enjoyed, any small objects that they have found like shells on a beach or sticks in the wood, a favourite toy that they are attached to etc. Special time is set aside for each child to talk about what’s inside their box at Family Group Time, and it is a great way of encouraging children to speak and listen to each other in small groups. There is much research to show how important reading stories is to young children and how it helps them to succeed in life. We provide a box full of books for our children and parents to borrow at any time. Your child will bring home a PACT book (blue) to record which books your child has chosen to share with you at home. You and your child can respond to the book in anyway you feel appropriate e.g. draw the main character, cook the recipe, build a vehicle, or something else. This book is a record of all the responses your children makes to the books they have shared with you. Your child will be invited to change their book at least once a week, but you are free to change it as often as you wish. Throughout the year we will write Learning Stories about your child that will give you a window into what they are learning and achieving in Nursery. We will explain what that learning means in terms of the Early Years Curriculum and invite you to make a comment. Your comment may just be to respond to what your child is doing in the Learning Story or it might be about what has happened since the Learning Story took place, something that your child has done at home.